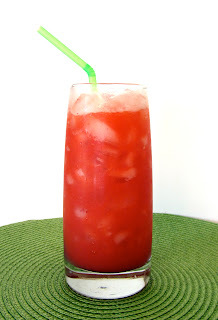 A fruity, refreshing, non alcoholic beverage - that's what an agua fresca is. This particular one is a burst of fresh strawberries and limes; absolutely delicious. I found the idea for this recipe, credited to Eat Live Run, at Pennies on a Platter. It sounded great. It was a cinch to make; three ingredients and it comes together in snap. I definitely recommend this drink - high yum factor! 1. Put the 1/3 cup of water and the sugar in a small bowl. Microwave for 20 seconds. Stir until the sugar dissolves. This is your simple syrup. 2. Puree the strawberries. Pour through a fine mesh strainer. 3. Combine the strained strawberry puree, simple syrup, and lime juice in a pitcher. Stir to blend. Stir in the 2 cups of water. 4. Pour over plenty of ice and serve!